Here’s the difficulty Mankind Divided faces: 2000 was a good year (not to be confused with ‘Russell Crowe inherits a vineyard’ movie A Good Year) for videogames. Tomb Raider. The Sims. Tony Hawk’s Pro Skater 2. Shenmue. Hitman. The Powerpuff Girls: Bad Mojo Jojo. 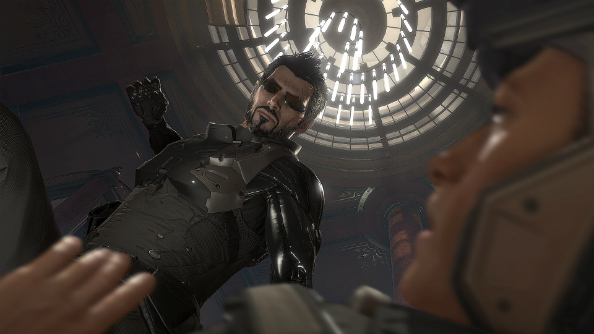 And everyone’s favourite sunglasses-at-night vehicle (take that, Men In Black), Deus Ex. The best of the bunch – cue a flood of hate mail from Shenmue 3 backers – it combined a mature, twisting storyline with brilliant world-building, and one of the most impressive opening levels gaming had ever seen. But its biggest impact, and the main reason why the game continues to top ‘best of all-time’ lists up and down the internet, resulted from its pioneering approach to player choice. 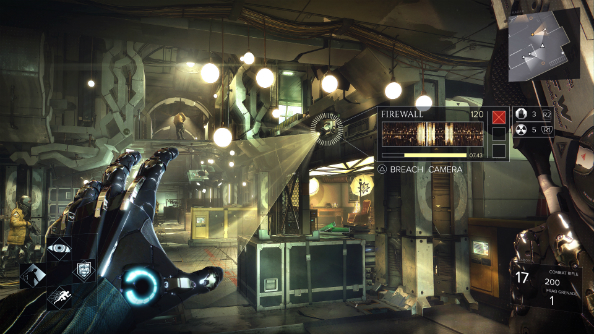 If you’re not big on reading, take a look at our Deus Ex: Mankind Divided hands-on impressions video instead. How you specced your own JC Denton directly changed how you could tackle objectives, and your decisions dictated whether you ended up playing a shooter, a stealth game, or something in between. Exploration and invention were rewarded, and player agency had a tangible effect. Foundations were laid. 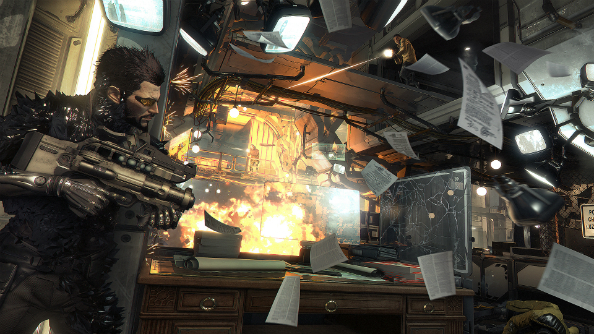 But in doing what it did so well, Deus Ex also created a problem. And in fact, so ahead of its time was what Warren Spector and Harvey Smith came up with, that it’s a problem which we’ve only felt the full force of in recent years, nearly a decade and half on from release. So many games now seem to feel obligated to indulge player choice and promote this ‘pick your path’ approach, whether it suits them or not. Even series which made their name as staunchly linear, cinematic experiences (here’s looking at you, COD) have attempted it. Some have done it very well. Others have not. And this year we have perhaps seen the purest distillation thus far, in gameplay terms at least, in the form of The Phantom Pain. But so often that advertised breadth of choice in fact boils down to one binary decision: go loud or stay hidden. ‘Play your own way’ is the promise. Hide in the grass/vents/shadows or shoot the men is the reality. Fortier is talking at Eidos Montreal’s headquarters, shortly after the game has been opened up to selected press to play for the first time. We’ve been granted two levels to try over the course of several hours, and are encouraged to replay each multiple times in order to – you guessed it – choose our own approach. The issue, then, is one which can be split. On the one hand – and this is what Fortier is speaking to – there are the narrative choices that games ask you to make. These are the decisions that affect endings, or which factions you side with, or which characters live or die. But then there are the micro, moment-to-moment choices; the ongoing sneak vs. shoot debate. Both can feel arbitrary, but maybe that’s not a problem. “We’re fundamentally a game about player choice and player expression, and if we’re going to offer choice, then it needs to be a fair choice. You really need to be able to decide what you want to do, and have a real opportunity to do it.” Why you do it is up to you, the point is simply that you can. 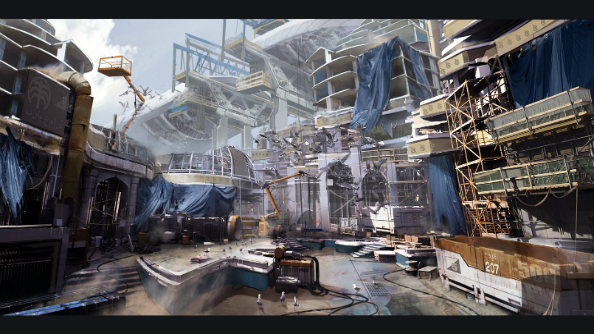 And in terms of the gameplay dynamics, Mankind Divided certainly does provide a wealth of options. Based on several hours hands-on time, it doesn’t seem that Eidos Montreal are attempting to reinvent the wheel in the wake of Human Revolution, or break the basic template. Even the names of the save game files I was presented with – Stealth, Combat, and Balanced – attest to that. 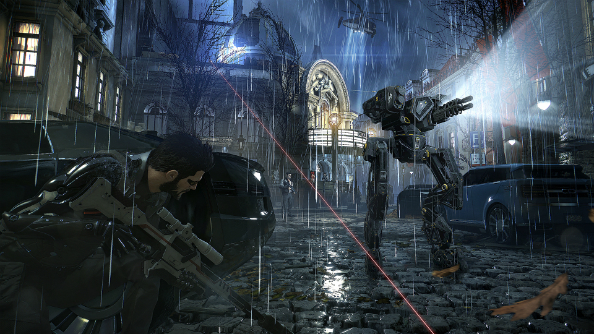 If you spec Adam Jensen out with stealth in mind then you’ll be clambering through air ducts, hacking into cameras and computer terminals, and dispatching guards from the shadows with your cybernetic super-arms. Opt for brawn and it’s shields, area-of-effect projectiles, and exploding blades fired from said super-arms. The latter of the two levels that I got to test out was set in Prague, towards the midpoint of the game, and clearly highlights how different routes through a level are opened up or closed off depending on the upgrade path that you’ve decided upon. The objective is simple: break into an office deep inside a theatre in order to search for information. Entering via a nearby tunnel each time, the obstacles facing me are consistent: a number of patrolling guards in the street leading up the to main entrance, a big bipedal mech pacing back and forth, as well as a sniper located on the roof. Stealth is up first – always my initial instinct – and my loadout has provided me with a tranquilliser rifle, a pistol, some gas grenades, and an EMP mine. 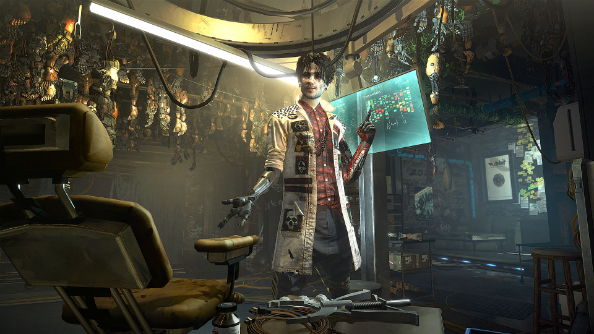 But more interesting, as ever, are the available augmentations. I have five: Smart Vision (see enemies through walls), TESLA (incapacitate bad dudes with a blast of electricity), Typhoon (fire out a 360° arc of projectiles), the Glass-Shield Cloaking System (turn invisible thanks to your fancy suit), and Leg Silencers (these silence your legs). All augmentations require power, displayed via a meter in the top left of the screen. It will partially recharge over time, but proper replenishment comes in the form of Biocells which can be found throughout levels. The section of Prague that has been opened to me is small (the map screen reveals that the full level is far larger), but it’s immediately clear that there are multiple ways to get to the target location. Last on my list, given the kit available to me, is to try the front door. A path around the side seems much more appealing, so I venture into a nearby subway, using the Cloaking System to stay hidden as I move from cover. As I reach the rear of the theatre a guard on patrol feels the wrath of my tranq gun, and I then stumble across a conveniently placed scissor lift. It requires a Biocell to power up, but I consider that a small price to pay for a helping hand to an inevitable rooftop entrance. And so it proves. Another couple of guards and an excitable camera (which can be dealt with via the Remote Hacking ability) are on the lookout, but soon I’m in the familiar haven of a vent and making my way inside. Once there I find several ways to proceed. Some require Jensen to punch through walls, which my pacifist build is far too feeble to do. One needs me to have the Icarus Dash (think Dishonored’s Blink) in order to clamber across the theatre’s rafters. I opt for minimal conflict, maximum cowardice: I fire up my Glass-Shield, sneak unseen through the lobby and into the backstage area via a side corridor. From there it’s just a short crawl to my objective, past a gaggle of guards gathered at a dressing room table. The good news is that the effort has paid off. My combat loadout comes with a rifle, a shotgun, frag grenades, as well as a couple of different augmentations: the short-range projectile Nanoblade, and TITAN, which provides a damage reduction barrier while in effect. And I make good use of them. Switching to armour-piercing ammo (such changes are now made on the fly rather than via your inventory) I take down the mech using my rifle and grenades. The ensuing alert causes a rush of guards to come my way, so it’s time for a delicious cocktail of two parts shotgun, one part TITAN. With the path cleared I head into the theatre via the main entrance, mopping up any last resistance. As I move into the auditorium itself, the AI systems at play become more apparent. In Mankind Divided these, and subsequently the awareness of your enemy as a whole, are not as interlinked as in something like Metal Gear Solid. While the gaggle outside all grabbed their guns when I first opened fire, those inside are still oblivious to what has happened. “[AI] is definitely a challenge!” laughs Fortier. “People compare it with games like Call of Duty, or Destiny. But it’s different: in Call of Duty you can’t sneak by; [the enemies] are all perfectly positioned and they’ve got the animations to do that because they don’t do anything else. That’s fine – I’m not criticising it – but you’re compared against those standards, so it’s hard to find the right balance. This solution that’s been struck upon – gating off the awareness of enemies in different locations – is slightly jarring, particularly in a post-Phantom Pain world. While I’m admittedly not as keen a theatre goer as I’d like to be, I feel fairly certain that a grenade going off in the lobby is audible from the stalls. But if one can suspend disbelief (while controlling a man who can turn invisible and fire swords out of his arms…) the point is surely to preserve choice. Were every guard to become aware of Jensen’s presence then one slip or irresistible headshot has committed you to a life – or at least a level – of violence. By placing these communication barriers it means that the player needn’t commit to one set approach for an entire mission, or be punished too harshly for a mistake. I could, therefore, revert to a more clandestine playstyle at this point, should I so wish. Instead I decide to pin two guards to the wall using my Nanoblade, gun down several more, and then hop on stage before firing up the Typhoon, showering everyone nearby with deadly shrapnel. Just like Laurence Olivier used to do. From there I can wander unmolested into the backstage area, mop up the final guards (another batch who haven’t twigged what’s going on), and make it into the office. I’m playing with loadouts which have been pre-made for me, but of course in the final game you’ll get to build your own. Full stealth, full Rambo, or anything in between – how you approach each objective needn’t be as binary as my first two attempts. And as I explore and toy around with the level several more times, it becomes obvious that there are micro decisions to be made at almost every turn. Do you hack a camera remotely, or use special ammo to disable it? Sneak past the guard, or take him out? Lethally or (relatively) compassionately? Even your kit presents such options, as things like the PEPS gun can provide a non-deadly blast, whereas the Nanoblade has a similar range but is far more impale-y. As is always the way in Deus Ex, certain routes and options will be blocked off to you depending on the abilities you do or don’t have (it’s worth pointing out that social interactions will also play a part in this regard, but none of these were present in the levels I tried out). But your choices will also be restricted by other, non-gameplay decisions. The objectives you choose to complete (or not), the factions you side with, whether certain characters live or die – all of these things will be in your hands at certain times, and you will feel the impact of them further down the line. Back to Fortier. “We wanted to push the low-level choice and consequence. Not just the story arcs that take place, but actual things that happen through your explorations, or through your dialogue with a person. Maybe I can open up certain possibilities, maybe I can open up certain interactions. Maybe I do them, maybe I don’t do them. Low-level things that you may not even realise you’re doing as a player. Such systems are introduced in the game’s opening level. Set in Dubai in a derelict hotel, Jensen is working with his new buddies at Interpol’s Task Force 29 in order to intercept an arms trade going down between their undercover operative, Arun Singh, and John Trent Sheppard, the leader of a smuggling cartel known as the Jinn. Dropping in from the roof, the objective is to block off access to the lobby to keep the Jinn from ruining the arrest. But there’s also a secondary objective to shut down their communications channel, should you locate it. This is entirely optional, but will have an effect on another mission later on. The showdown in this level itself can also go down different ways. The buy is interrupted by a group of augmented soldiers wearing gold masks, who appear from nowhere and take out the Jinn members. A firefight ensues between this lot and Jensen’s task force, and it’s your job to remove the battery from a helicopter in order to prevent them absconding with the goods. A raging sandstorm means that this can be done sneakily or not, but the more interesting point of divergence is that you can fail to protect Singh in the midst of all this. Keeping him alive is another secondary objective, and if you don’t give him the requisite protection or complete your task in time, he carks it. The knock-on effects that this will have down the line will only become clear when playing the game as a whole, but you can be sure that they’ll be there. And how things pan out down that line will be primarily down to you, the player. 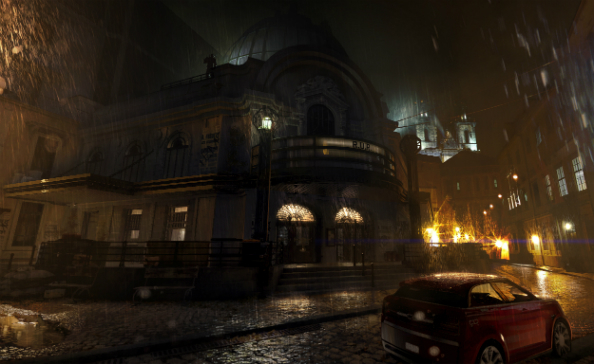 It may not be the game’s true legacy, but the narrative in the original Deus Ex was wonderful. A globetrotting tale of conspiracies, double-crossing and hidden agendas, it ended by granting the player a three-way choice regarding, essentially, the fate of the world. With every answer a shade of grey, it was a wonderfully climactic moment and something that few games before had even attempted. It was an approach that Human Revolution copied, with more limited success. Not only did the final decision not feel as fleshed out or conflicting, but in the 11 years since the original released player expectations have changed. No longer are we satisfied with all of our prior actions being made irrelevant by one overarching judgement (just ask the guys at Bioware), now we demand that our agency throughout the game be recognised in the end-state. It’s something that the Eidos Montreal team are acutely aware of. “We don’t want to have a ‘choose your ending’ at the end of the game,” acknowledges producer Olivier Proulx, “but it’s complex to build organically, the choice of the players, and have it reflect towards the end of the game. This is something that, justifiably or not, I see people complaining about. Games such as PS4-exclusive Until Dawn are proving that it’s possible to produce a wealth of end-states based on actions throughout the experience, and are even happy to lift the lid and show players how it’s done. But would such an approach even be possible for a far less scripted, far more emergent proposition like Mankind Divided? It seems a remarkably tough ask – but when has that stopped people getting up in arms about something? The burdens that result not just from the Deus Ex name, but from a celebrated predecessor, are not lost on Proulx. 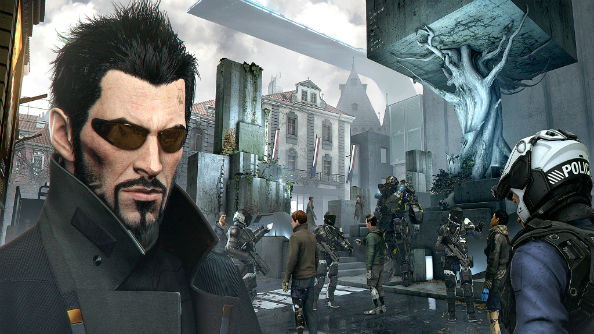 “Deus Ex is such a beloved franchise, and it has a lot of love with that name – there was a lot of pressure on the team to meet expectations [with Human Revolution], or to prove people wrong and that they weren’t going to fail. All the design decisions they were making were under heavy scrutiny. 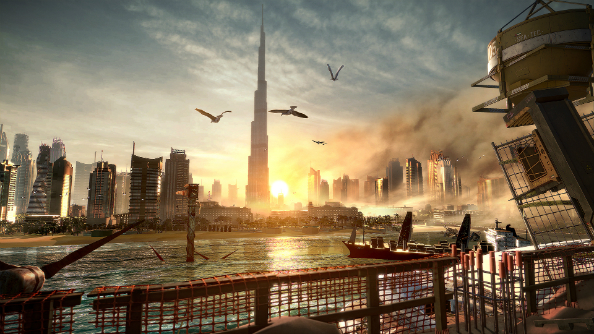 I’m in no doubt that Mankind Divided is going to be excellent, and that it will succeed from a gameplay perspective. After all, it’s doing what Human Revolution did but with better gunplay, more options, and more scope to personalise your playstyle and character. Just how excellent it is will be dictated by how it delivers its narrative, and the oft-discussed choice and consequence within it. Here, we’re two years after the ‘Aug Incident’ of Human Revolution, and still more than 20 before the events of the original game. Amid the resulting division in society between the augs and the aug-nots, Jensen is a conflicted character, and tensions are running high. The dilapidated hotel that plays host to the game’s opening level is in disrepair because it was being built by augmented workers. In Prague that office you’re breaking into belongs to Radich Nikoladze, kingpin of the Dvali crime family, and you’re hunting for a connection between him and the Augmented Rights Coalition, suspected of blowing up a train station. Eidos Montreal are not afraid to tackle sensitive issues, or present a bleak view of humanity’s future – the team talk of “mechanical apartheid” and segregation – and there’s a confidence that they’re set to deliver. Given the series history, and the accompanying level of expectation, going nowhere is not an option. The original was a genuine pioneer; Human Revolution brought the Deus Ex name back with some style (we don’t talk about Invisible War). 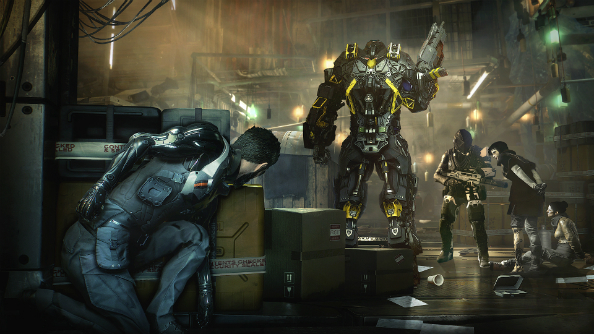 Mankind Divided is not revolutionising choose your approach gameplay, but nor does it need to – the same but more/better is just fine this time around. For people to still be eulogising over it 15 years hence, however, it does need to do so in terms of how player agency shapes narrative. Is that likely? I choose to live in hope.